Lynn is the Co-Founder and CEO of Pivt, the app to make you feel more at home. She is also a Senior Associate at Autonomy Ventures, where she procures deal-flow, manages teams, and drives value creation of portfolio companies. Additionally, Lynn is a Board Member and the VP of Panels for the New York Venture Community (NYVC) and a Mentor at Women in Business at Yeshiva University. 1.How did you get started in the wonderful world of VC? I got into VC serendipitously, and am so grateful I did. A month after graduating from college, I moved to London to work for Bloomberg. While I was there, I faced the same challenges and general uncomfortableness that so many of us experience when moving to a new and unfamiliar city — how do I go about finding information on my city from people I trust and how do I build my network? I knew that I had friends, friends of friends, people from my hometown, university and workplace in Europe, but there was no way to tap into my existing network and connect with them in a meaningful way. I was determined to find a better way. With very little tech experience, I attended as many startup/business workshops as possible. Everything from how to build a startup to marketing 101. I read stacks of books, listened to hours of podcasts, and listened attentively to anyone who would talk to me about their struggles with being in a new city. I eventually moved back to New York to get my startup off the ground, but knew that I had so much more to learn. After a couple of months of hustling at events and cold messaging managing partners, I was granted a great opportunity to work as the sole associate at Autonomy Ventures, a NY based venture fund investing in robotics, artificial intelligence and autonomous mobility. I love a challenge and these were spaces that were not only bound to take off, but were going to affect every industry. From there, my VC journey took off. Investing at a very early stage to me means that you are really investing in the founders. You expect the companies to pivot over their lifespan, so it’s essential that you trust that the founders are the right people to take the company from zero to hero. The market of course is also crucial. How crowded is it? What’s the competitive advantage of the startup? How are they viewing and tackling the problem differently? 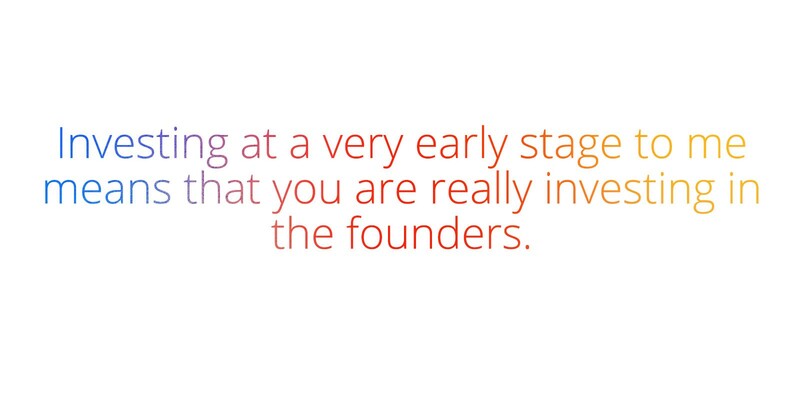 The third aspect I always look for is why the founders created the startup. Did they experience the struggle themselves or did they just want to work for themselves, so they started a company? What makes them industry experts and more importantly, what is giving them the perpetual drive to keep going and progressing? 3. From an investors standpoint, being the one who gets to invest in the “future of everything,” what can we expect to see in a 5–10–15 year timeline? It’s a really exciting time, several industries are on the cusp of significant change. 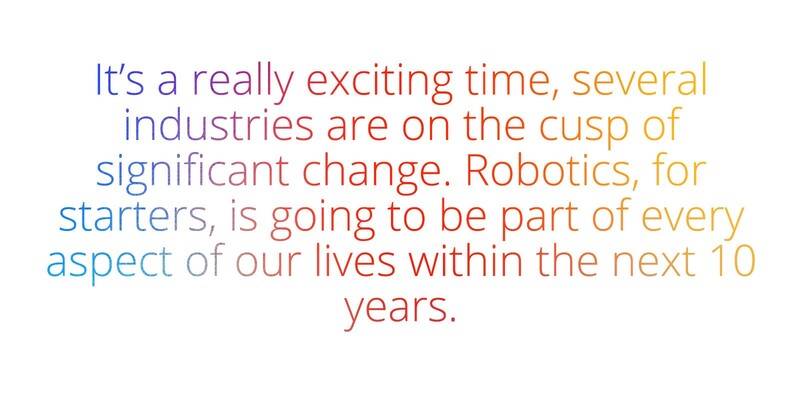 Robotics, for starters, is going to be part of every aspect of our lives within the next 10 years. As a result, there will be a domino effect in every other industry, including the government. There will need to be significant policy change and we will need to figure out how to make up for the loss of jobs due to automation. This I think will also gradually affect education, in the sense that in this increasingly dynamic and unpredictable job market, we will need to get a more well rounded education, as opposed to focusing on specific skills and sectors. It will be essential that people will be able to adjust to and thrive in an environment of constant change. 4. What themes, trends, or sectors are you primarily interested in and why? I’m very excited to see how autonomous mobility changes our world. We are not that far off from there having level 5 autonomous cars dominating the roads. What will our experience be like as passengers? How will this affect energy, hospitality, the future of work, policy change, safety, smarter cities, community? Travel tech is also a big interest of mine, as we are as a society increasingly on the move. The world is becoming more global, yet smaller. There’s a surplus of opportunity that can come from this trend. Over the last few years, I have taken an enormous interest in figuring out what makes a place feel like home. It’s no secret that people are more mobile than ever before. Home is no longer restricted to the place you were born, grew up, or where your stuff lives. According to the UN, there are over 258 million people today living in countries that are not their own, representing an increase of 49% since 2000. The hope is that if we can figure out what makes a place feel like home and give people the tools to recreate it anywhere, more people will take on boundless opportunities and make the most of them, as soon as they arrive. To me, education and healthcare will always be underfunded. These sectors are pivotal to our progression and well-being, so there can never be enough attention or devotion to these spaces. While the future really lies in the hands of the founders, who are changing the status quo and making the world better, VC’s can help accelerate this. This means staying up to date, being chronic learners, sharing information, experience and lessons learned, while connecting people who may be able to collaborate for the better. While it can be a difficult challenge to create high returns for LP’s, while also investing in companies that are improving the lives of others, luckily these two overlap quite a bit. VC’s also have the responsibility to make the world of innovation and tech a more accepting and just space. 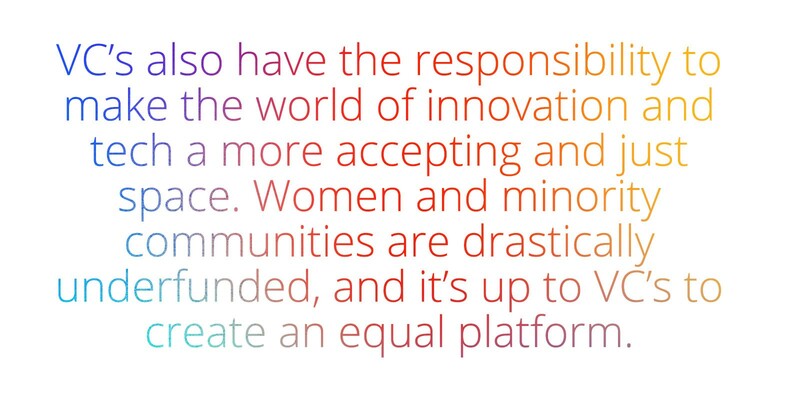 Women and minority communities are drastically underfunded, and it’s up to VC’s to create an equal platform. 8. What does the future look like for you? What’s next?! I’ve learned that hard work, perpetual curiosity, collaboration and the ability to take and idea and flip it on its head, is the recipe for making the most of opportunity and the world at large. 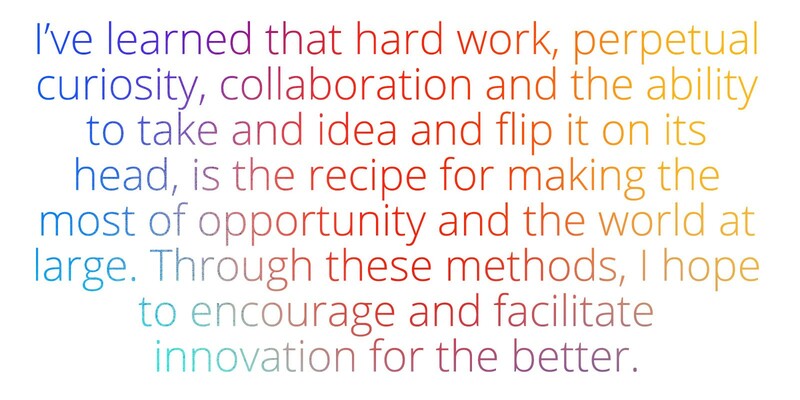 Through these methods, I hope to encourage and facilitate innovation for the better. By sharing my experience, connections, lessons learned, and support, I hope to help others embrace opportunity and make the most of it, hopefully leaving the world in a better place than we found it.